Magical genie pose! Push Shimmer's hands together to see her switch into her signature "floating pose"
Kids can clip Shimmer onto her carpet for a magic carpet ride! Shimmer and Shine, floating genie divine! This beautiful Shimmer doll features a fun, magical action! Kids can push Shimmer’s hands together to see her magically switch into a cross-legged position, so she’s ready to ride a magic carpet or take her signature "floating position." For added fun, kids can also place Shimmer on her carpet and pretend she’s soaring high above the clouds in Zahramay Falls! 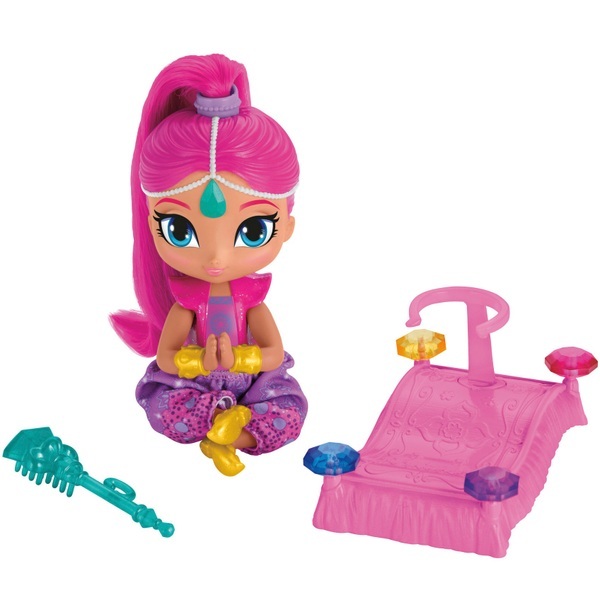 The carpet can be decorated with the included Genie Jewels and Shimmer’s sceptre doubles as a hairbrush!